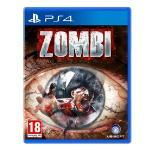 Zombi (PS4) Expert Reviews - Read Reviews and Buy Smarter Online. Verdict: Zombi is the PS4 and Xbox One port of well-known Wii U title ZombiU, only sans the U. Released on August 18 th 2015 after dwindling sales on the Wii U, does this PS4 version live up to its original Wii U standards? Verdict: In pop-culture, it seems as though the theme of zombies has been done to death (excuse the pun). But just like zombies themselves, the theme keeps coming back from the dead in new and interesting ways. Verdict: The zombies are back and this time they're taking a lot more victims down with them. Ubisoft's amazing zombie survival horror game Zombi U has now been fully ported to more than just one console. But, like with all other ports, is it worth your time? Verdict: Ubisoft Montpellier is best known for the Rabbids games, Beyond Good and Evil , the Rayman series, and that one King Kong game that is generally thought to be one of the better movie tie-ins around. Verdict: It's like Dead Island Lite! Verdict: One of the best survival horrors of recent years, that functions almost as well as the Wii U version and offers a mature-rated adventure that is as ruthlessly difficult as it is engrossing. Verdict: It's hard to imagine a more dreary London than that of Ubisoft's Zombi (or ZombiU if you played it a while back on Wii U). Not quite fifty shades of grey makes up the colour palette and constant rain makes up a perfect backdrop to a post-apocalyptic tale of conspiracies and prophecies. Verdict: It seems like ages ago I hunkered down to play Ubisoft's ZombiU on Nintendo's Wii U console. At the time, I was impressed with some of its innovations and how it utilized the Wii U's GamePad. All in all, it was a decent mature rated game for early Wii U adopters. Verdict: With their tanks and their bombs. Verdict: Zombi is hardly a deluxe version of ZombiU, with numerous bugs and few graphical improvements. It's still a good survival game, but feels outdated and misses the Wii U Game Pad. Verdict: Ubisoft, when you ported this over from the Wii, you forgot to bring the ammo with it, and so it would be nice to play with the guns, but it's always over too quickly. Nice game though, showing it's age a bit, but that isn't bad in this case. Verdict: Plagued by horendous 'gamebreaking' glitches (and countless less harmful but still annoying glitches) which Ubisoft have failed to fix in the 3yrs the game's been out. Real shame as it would have otherwise been decent. Verdict: i love the survival the survival elements of this game! Not the best graphics but one thing is for sure this game is very hard! On my first playthrough in the end i couldnt finish it because i couldnt use c4 and i had to start the campain all over. Verdict: Looks to be a great zombie game at a even greater price!! This is for the zombie lovers who can't get enough. I can't wait!! Awesome slow paced zombie experience. Verdict: For me, this is very close to the zombie game I've been waiting for, for a long time. It's a slower paced game that lets you be smart about the way you want to explore an infested city, and I love that.